Money from this latest bundle goes towards the Electronic Freedom Foundation, which defends digital civil liberties. 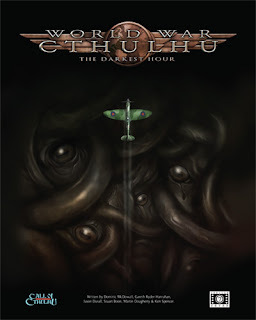 World War Cthulhu - The Darkest Hour: This complete game (based on the Call of Cthulhu RPG) sets the battle against Great Old Ones and Elder Things in the arena of World War 2. It gives you everything you'd want, including a full multi-session, an open-ended adventure, and excellent inspiration for creating your own scenarios. World War Cthulhu - Europe Ablaze: Six World War 2 adventures that contain some interesting ideas. They range from standard Lovecraftian ideas in a war setting to material that's more brutal and unfair. 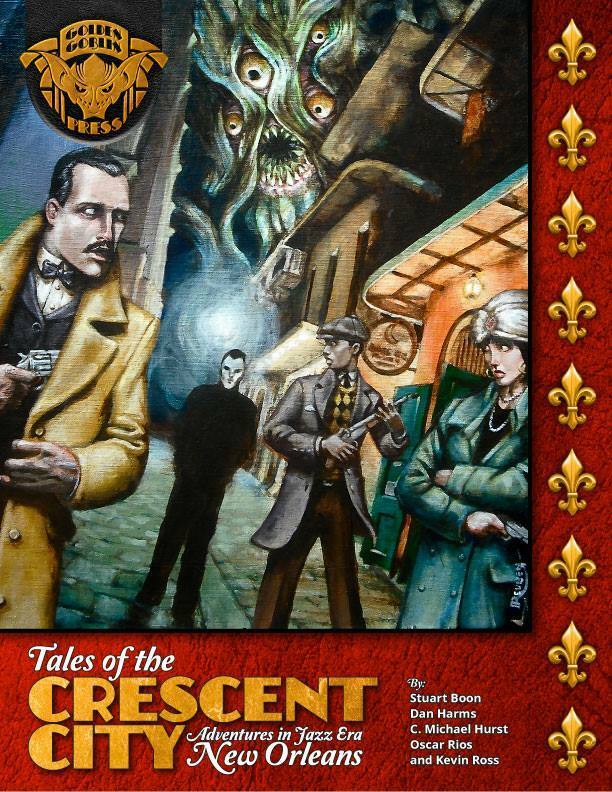 Tales of the Crescent City: Six noir-esque adventures set in New Orleans. Features three adventures I'd like to run right now. 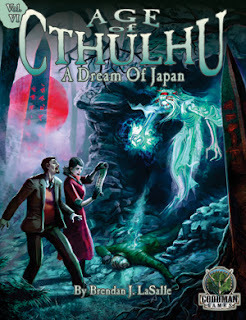 A Dream of Japan: A creepy trap of an adventure that contains the seeds of an epic campaign. Between the Starter Collection and The Bonus Collection, there's more than enough material to create an anthologised Call of Cthulhu campaign. I didn't know this, but World War Cthulhu (WWC) is a series of settings that puts Cthulhu tropes into different 20th century conflicts. The Darkest Hour is set in World War 2, where you play intelligence agents who are also occult investigators (a pitch that reminds me quite a bit of Tim Powers' Declare). It's a strong device to justify investigators working together on multiple missions (if they survive and remain sane). This book gives me everything I'd want, including a full multi-session and open-ended adventure. It's an easy read: clearly laid-out, nicely broken up by headings and sub-headings, and a logical order to things. This is a set of six adventures set during World War 2. There's something about this wartime setting that feels right to me. It gives adventures two tracks to worry about. It gives a sense of realistic consequences to the action and the NPCs. It creates interesting ironies, subtext and choices. 'We Will Remember Them' has a interesting flashback structure and promises to fundamentally change investigators who participate. The flashbacks feel a bit like the opening cinematic to a video game, and the whole module reads like it'll take agency from the investigators in an interesting way. The final three scenarios are tight monster-hunts and military operations. It contains a revised version of a classic CoC adventure ('Tell Me, Have You Seen The Yellow Sign') as well as a sequel adventure written by the same author. 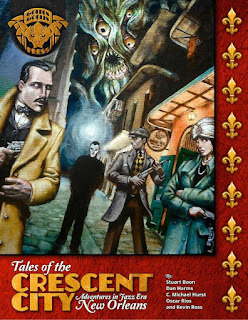 Tales of the Crescent City efficiently orients you to New Orleans. I'd like a player handout that gives you a quick bullet-pointed summary of basic facts about the city, but it's very easy to do that with the material provided here. On first glance, 'Tell Me, Have You Seen The Yellow Sign' (TMHYSTYM) feels like a noir. There are lots of characters, each of whom has interesting secrets. It's also a bit of a sequel to Lovecraft's story 'The Call of Cthulhu'. I love the stakes for failing in this adventure: the relentless spread of the King in Yellow's rule. In fact, framing most of these these adventures through a noir lens feels pretty good choice to me. I love a good disease story and 'The Quickening Spiral' delivers. It feels like this mystery could be quite open-ended, though ... and I wonder if selecting appropriately skilled and motivated investigators (physicians, city officials) could be important to its success. 'Song and Dance' features my favourite Great Old One: it's a creepy and distressing old acquaintance that warms my heart every time I see it appear. I really dig the idea behind this scenario, which involves artists, muses, and has a faint 'disease' / epidemiological vibe to it. 'Five Lights At The Crossroads' has a hell of an opening scene. This is a tightly-focused manhunt where everything's pretty obvious but tricky to resolve. I liked it a lot. 'Asylum: The Return of the Yellow Sign' is set two years after TMHYSTYM. It's good but I like the faint suggestion that there might be a parallel world where the events of the previous adventure ended in success for the King in Yellow and now those successes could be bleeding through into our world. That threat undercuts any feeling of success and satisfaction the investigators have--and I think CoC plays best when the investigators are unsettled. Features a nightmarish and brilliant finale. It promises to enmesh the investigators in a plan that has been playing out for thousands of years, that they are pawns in. A Dream of Japan contains content involving insanity and suicides, and deals with it through the lenses of pulp and horror, rather than realistically and with emotional weight. The implications in this adventure's final two pages point to an amazing second act of the adventure / way to resolve the situation.